Colorado’s red-hot marijuana industry is creating an avalanche of jobs as new cannabis companies launch and existing businesses expand, underscoring the impact legalization can have on the broader economy. As of December 2015, the state had issued 26,929 occupational licenses to workers employed at medical and recreational cannabis companies – a whopping 68% increase from December 2014, according to data provided by the Colorado Department of Revenue. At the end of 2013, when only medical marijuana businesses existed (the rec industry launched in 2014), there were less than 7,000 occupational licensees in the state. Colorado requires employees of businesses that handle cannabis – including retailers, cultivation sites, infused products companies and testing labs – to obtain occupational licenses annually. Some employees of vendors who serve these companies also must get licenses. The actual number of workers employed in Colorado’s industry is actually much higher than the occupational licensing figures imply. Employees of many ancillary companies aren’t required to obtain the permits because they don’t come into contact with marijuana frequently as part of their jobs. So the industry likely employs thousands – if not tens of thousands – of additional workers. 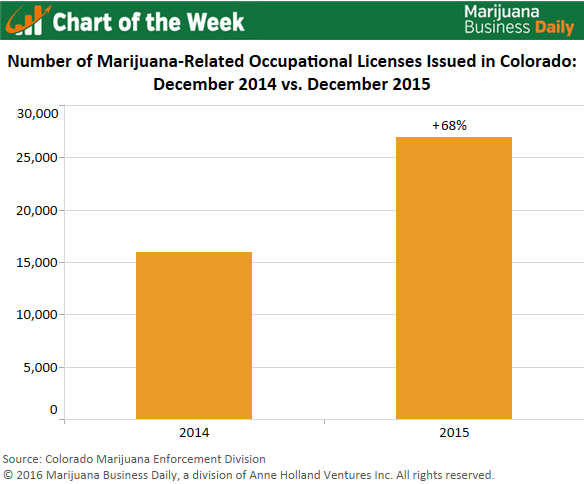 The spike in occupational licenses mirrors the immense growth Colorado’s marijuana industry saw last year. Overall sales of both medical and recreational cannabis at the retail level jumped more than 40% in 2015, hitting $1 billion. Sales are expected to continue the upward trend this year, rising to an estimated $1.1 billion to $1.3 billion, according to the recently released 2016 Marijuana Business Factbook (published by Marijuana Business Daily). That equates to an increase of 10%-30%. If 2015 is any indication, cannabis job growth could exceed that range. Now that we have 4 legal states with the now total of 26 states for medical and 4 recreational States, we should sue the Federal Government under a show cause lawsuit, and expose the lies once and for all. Show cause would force the Congress to reverse the false laws that have damaged countless lives. This election will shake up the den of corruption one way or the other, politic’s will change forever in 2016. It’s not going to be pretty.